Fibromyalgia syndrome (FM) is a disorder of widespread myalgia; hyperalgesia (increased sensitivity to painful stimuli); allodynia (pain produced by non noxious stimuli); poor, non-restorative sleep and generalized fatigue (Bennett, 1993). The prevalence of the syndrome is up to six times greater in women (Wolfe, Ross, Anderson, Russell & Herbert 1995). It accounts for between 10 and 20% of all new out-patient referrals to rheumatology clinics (Wolfe, Ross, Alderson, Russell & Herbert 1995) and is reputed to be the most common diagnosis in rheumatology out-patients under the age of 50 (Yunus et al., 1981). Despite much research and many different theories, evidence for an organic aetiology remains elusive (Bengtsson, Henriksson & Larsson, 1986; Carette, Oakson, Guimont & Steriade 1993; Jacobsen, Wildschiodtz & Danneskiold-Samsoe 1991; Simms, Roy, Hrovat & Anderson 1994; Yunus, Kalyan-Raman, Masi & Aldag, 1989); Wolfe, 1997). Numerous studies have, however, shown a high incidence of psychological distress in patients with fibromyalgia (Ahles, Yunus, Riley, Bradley & Masi 1984; Alfici, Sigal & Landau 1989; Clark, Campbell, forehand, Tindall & Bennett 1985; Goldenberg, 1986; Hudson, Hudson, Pliner, Goldenberg & Pope 1985; Hudson, Goldenberg, Harrison, Keck & Schlesinger 1992; Kirmayer, Robbins & Kapusta 1988; Piergiacomi , Blasetti, Berti, Ercolani & Cervini 1989; Tariot, Yocum & Kalin 1986). In light of the continued lack of evidence of an organic cause, even Frederick Wolfe, who helped develop the construct of and diagnostic criteria for FM, acknowledges that there is little evidence that it is a disease (Wolfe, 1997). At the present time, therefore, it is probably most helpful to view fibromyalgia as a chronic, diffuse pain syndrome (Carette, 1995). The polysymptomatic picture of fibromyalgia, with individuals commonly reporting subjective joint swelling; joint stiffness; generalized weakness; hyperaesthesia; thermoregulatory dysfunction; irritable bowel; irritable bladder; poor short term memory and food intolerances is reminiscent of somatisation disorder. Several studies have found an association between fibromyalgia and somatisation on the Symptom Checklist-90 (for example, Hudson, Hudson, Pliner, Goldenberg & Pope 1985; Kirmayer, Robbins & Kapusta 1988). Developing this idea further, Brosschot and Aarsse (2001) recently proposed that fibromyalgia may be partly caused, or sustained by, restricted emotional processing and the subsequent attribution of emotional arousal to somatic causes. A substantial literature exists examining the role of emotions in a range of chronic diseases, such as Fibromyalgia, in terms of aetiology, progression and outcome. Pain as a construct has a particularly close affinity to emotions. In the first instance, emotions are an integral part of the language of pain, to the point where affective descriptors of pain constitute a major part of commonly used, standardized, pain assessments such as the McGill Pain Questionnaire (Melzack R., 1975). Secondly, emotions such as anxiety and depression are very common in chronic pain patients, although the direction of any causal relationship has not been proven. Thirdly, emotional arousal is inextricably interwoven in the different phases of the production of the pain experience – from perception of initial stimuli, identification of nocioception, appraisal and subsequent behaviour (Kreitler & Niv, 2001). In 1959, George Engel presented a theoretical model proposing that, pain, which defied organic explanation, was a defense against unconscious psychic conflict. Emotional pain was therefore displaced onto the body where it was more bearable and acceptable. In this way, for some individuals, persistent unexplained pain could promote psychic equilibrium by fulfilling emotional needs (Gamsa, 1994). 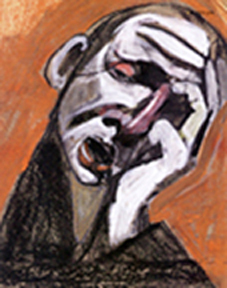 In the second half of the twentieth century, psychoanalytic theory, based on Engel’s original model, informed an extensive literature exploring the concept that emotional problems generate and perpetuate chronic pain. There is a growing literature examining processes that people use to identify, understand and express or otherwise manage their emotions. Contemporary theory and research indicates that the effects of everyday inner conflicts and stressful experiences are mediated by the individual’s emotional processing of the event. Two key emotional regulation processes have been identified as being of vital importance to both physical and mental well-being (Kennedy-Moore and Watson, 1999). The first is whether emotions are expressed or inhibited, and the second is the individual’s ability to be aware of, identify and understand their emotions. Emotional expression has been associated with improved immune functioning (Esterling, Antoni, Kumar & Schneiderman 1990; Sherman, Bonanno, Weiner & Battles 2000), decreased physical health problems (Pennebaker, 1986; 1990; Pennebaker, Barger & Tiebout, 1989), increased survival time for individuals with cancer (Fawzy et al., 1990) and improved physical functioning and sense of well-being in rheumatoid arthritis (Kelley and Lumley, 1997). The expression of emotion is also presumed to be beneficial in mental health and much counselling involves working with events in an individual’s life that they have failed to process emotionally (Baker, 2001). It is also recognized, however, that unrestrained emotional expression can be damaging to physical and mental health and that a balance between emotional expression and emotional control is most adaptive to health (Morrow and Nolan-Hoeksema, 1990; Nolan-Hoeksema, 1991; Rohde, Lewinsohn, Tilson & Seeley 1990; Teasdale and Fennell, 1982; Van der Kolk, 1996). Emotional inhibition or control are terms used to define the extent to which individuals control their reactions when a particular emotion is experienced (Watson and Greer, 1983). Much of the research in this area has focused on individuals with cancer, with a number of longitudinal studies finding a positive relationship between extreme emotional control and the progression of cancer (Epping-Jordan, Compass & Howell 1994; Jansen and Muenz, 1984; Jensen, 1987; Stavraky, Donner, Kincade & Stewart 1988). Other studies have found associations between emotional inhibition and rheumatoid arthritis (Gardiner, 1980; Moos and Solomon 1965a; 1965b; Navlen and O’Brien, 1964; Udelman and Udelman, 1981), cardio-vascular disease (Friedman, Hall & Harris 1985; Friedman and Booth-Kewley, 1987), anxiety and depression (Beutler, Engle, Oro-Beutler, Daldrup & Meredith 1986; Grassi and Molinari, 1988), post traumatic stress disorder (Foa and Kozak, 1986; Rachman, 2001) and panic attacks (Baker, Holloway, Thomas, Thomas & Owens 2004). More recently, Brosschot and Aarsse (2001) found an association between emotional inhibition and fibromyalgia. There is evidence to suggest that when emotional expression is actively inhibited, individuals show immunological changes consistent with poorer health outcomes (Schwartz, 1990). ‘Alexithymia’ is defined in the literature as a deficit in a person’s ability to employ cognitive processes to identify, differentiate and communicate one’s affective states (Taylor, Bagby & Parker 1997). The alexithymic individual may experience high levels of emotions but has difficulty labelling and describing those emotions. It has been proposed that alexithymia impedes the successful regulation of emotions, particularly negative affects, resulting in chronic sympathetic hyperarousal, physiological sensations, somatosensory amplification and complaints of physical symptoms (Lumley, Asselin & Norman 1997). Many studies have shown that alexithymia is common in individuals with a range of psychosomatic conditions (Deary, Scott & Wilson 1997; Kleiger and Jones, 1980; Porcelli, Zaka, Leoci, Centonze & Taylor 1995). Many studies have found a high incidence of alexithymia in individuals with chronic pain of non-malignant origin, compared to healthy subjects (Blumer and Heilbronn, 1982; Catchlove, Cohen, Braha & Demers-Desrosiers 1985; Fernanadez, Sriram, Rajkumar & Chandrasekar 1989; Kosturek, Gregory, Sousou & Trief 1998; Kreitler, Gohar, Eldar, Ezer & Niv 1995; Lumley et al., 1997; Millard and Kinsler, 1992; Porcelli et al., 1995; Sriram, Ghaturvedi, Gopinath & Shanmugam 1987). A higher prevalence of alexithymia has also been reported in patients with fibromyalgia, compared to healthy controls (Brosschot and Aarsse, 2001). Whilst Smith, Lumley & Longo (2002) found that identifying, trying to label and understand one’s emotions and expressing them appropriately was associated with reduced pain in a chronic myofascial pain population, the majority of studies have found no relationship between the clinical features of pain and alexithymia. In another study of patients with chronic myofascial pain, Lumley, Smith & Longo (2002) reported that, whilst alexithymia was not related to pain intensity or the sensory qualities of pain, it was related to the affective dimension of pain – as measured using the McGill Pain Questionnaire. They argued that these findings were consistent with the larger literature on the role of emotion and emotional regulation in influencing the pain experience. That is, whilst the sensory dimension of pain appears to be modulated by neural processes, the affective dimension of pain is regulated through the limbic system and influenced by negative mood states and emotions. It has often been suggested that alexithymia may be of aetiological significance in chronic pain for which there is no organic cause, with individuals experiencing somatic pain because they have no other means of expressing difficult emotions (Kreitler & Niv, 2001). Without longitudinal studies, however, this cannot be proved. All the studies that reported a high prevalence of alexithymia in a chronic pain group found a strong relationship between depression and alexithymia. In light of evidence that alexithymia is common in those with depression (Taylor, Trotter & Csuka 1995), Lumley, Smith & Longo (2002) proposed that depression may mediate the relationship between alexithymia and chronic pain. ‘Emotional processing’ refers to a set of psychological processes rather than a diagnosis or personality type as in ‘alexithymia’. Excessive emotional control, meanwhile, is one of a number of potential deficits in the emotional processing process. Rachman (2001, p165) argued that, whilst most individuals are able to “absorb….. disturbing emotional experiences satisfactorily”, when this does not happen, it may lead to prolonged high levels of arousal with consequences for the individual’s daily functioning, health and well-being. In an appropriately titled study ‘The only way out is through’, Hunt (1998) demonstrated that healthy subjects who cognitively processed their negative experiences thoroughly had better outcomes than subjects who used distraction or other behavioural coping strategies. Rachman (2001) hypothesized that post-traumatic stress disorder could be a prime example of the long-term ‘reverberation’ and re-experiencing of poorly processed emotional experiences. Case studies have indicated that panic sufferers describe or demonstrate a range of difficulties with emotions including; fear of strong emotions; lack of awareness of emotions, excessive emotional control and suppression of feelings (Chambless & Goldstein, 1981; Shear & Weiner, 1997). Baker, Holloway, Thomas, Thomas & Owens (2004) found that a group with panic disorder showed a significantly greater propensity to control feelings of anger, unhappiness and anxiety than healthy subjects. They also controlled their emotions more and had more difficulty labelling emotions. Whilst the evidence would seem to indicate that there is a relationship between restricted emotional processing and mental health problems, Brosschot and Aarsse (2001) hypothesized that fibromyalgia might be partly caused or sustained by restricted emotional processing and the subsequent attribution, by individuals, of emotional arousal to somatic causes. They characterized restricted emotional processing as a disconnection between emotional responses and physiological responses. Accordingly, their study continuously monitored affective response and heart rate, while symptoms and their causal attributions were measured before and after showing participants emotional movie excerpts. Compared to healthy subjects, the FM group showed higher levels of affective-autonomic response dissociation, and less emotional variability. Whilst no assumptions could be made about the causal direction of the relationship, the study did seem to demonstrate that an FM group had a more restricted emotional processing style, when compared to healthy subjects. Two retrospective studies have found a higher prevalence of sexual and physical abuse in women with fibromyalgia compared to healthy female controls and a matched population of women with rheumatoid arthritis (Boisset-Pioro, Esdaile & Fitzcharles 1995; Taylor, Trottor & Csuka 1995). Furthermore, in both studies, those in the experimental and control groups who had been sexually abused reported more somatic symptoms and greater pain intensity than those who had not been abused. Whilst the cross-sectional design of these studies did not allow causal relationships to be established, the findings have lead weight to the argument that some individuals experiencing either subconscious or conscious psychological distress may perceive pain as a more acceptable complaint. Whilst there is some evidence indicating a higher lifetime prevalence of adverse life events in individuals with fibromyalgia, Kanner, Coyne, Schaefer & Lazarus (1981), suggested that daily hassles could, in fact, cause greater stress than major life events. Dailey, Bishop, Russell & Fletcher (1990), subsequently found that patients with fibromyalgia perceived themselves to experience a greater number of daily hassles than a matched sample with rheumatoid arthritis and a healthy control group, even when illness related items were eliminated from the scale. The evidence of a high lifetime prevalence of substantial emotional trauma in FM patients, coupled with the fact that they perceive more daily hassles, may have significance if, as Brosschot & Aarsse (2001) claim, they have greater difficulty expressing and processing their emotions. In view of the large body of literature attesting to the psychological and physical consequences of failing to process emotions satisfactorily, one aetiological hypothesis might be that fibromyalgia could be the somatic resolution of a failure to process emotions successfully.